In Brazil's efforts to strengthen ties between Mercosur and ASEAN—the Association of Southeast Asian Nations—the Latin American country has played a key role in bringing the southern region of South America and Southeast Asia closer together. The statement was made by Ambassador Marcos Galvão, Secretary-General at Brazil's Foreign Ministry, during a ceremony at the Thai Embassy, in Brasília, held to celebrate the association's 50th anniversary. ASEAN is formed by 10 countries: Indonesia, Malaysia, the Philippines, Singapore, Thailand, Brunei, Myanmar, Cambodia, Laos, and Vietnam—home to a total of 620 million people. Mercosur, the bloc made up of Argentina, Brazil, Paraguay, and Uruguay, “is a natural partner for the association, not only because they are both crucial projects for integration in their regions, but also because they have taken the same position regarding several aspects of their international agenda, like the promotion of sustainable development and the focus on trade as a key tool for development and integration,” the Brazilian diplomat declared. 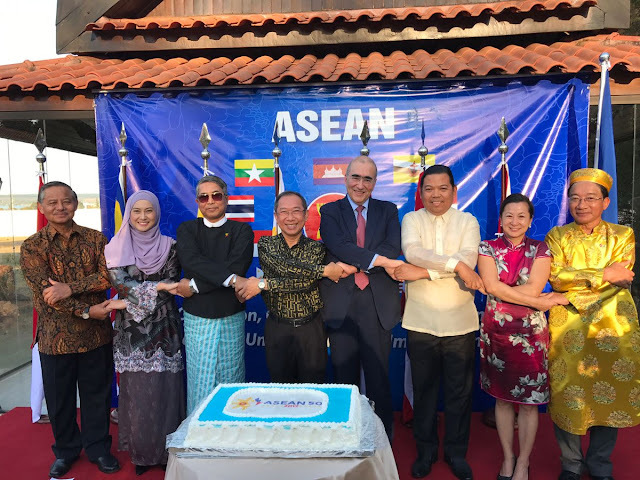 Based in Brasília, ASEAN committee chairman and Thai Ambassador to Brazil Surasak Suparat, noted that the Asian economy is still on a strong rise. “ASEAN served as an engine boosting the global economy,” he said. ASEAN, Suparat said, is intent on providing a great environment for all business activities. “We're ready to become a platform for greater economic involvement between Brazil and ASEAN,” he declared. The secretary-general pointed out that ASEAN is Brazil's second biggest partner in Asia, boasting a bilateral trade adding up to over $16.5 billion. “[Brazil-ASEAN] investments are flourishing. For business communities in Southeast Asia and South America, the distance separating both regions was reduced by the exceptional development opportunities on both sides of the Pacific,” Galvão remarked. After accompanying President Temer on his official trip to China for the BRICS summit meeting, Brazilian Foreign Minister Aloysio Nunes Ferreira is also expected to visit three countries in the region, namely Malaysia, Singapore, and Vietnam, Galvão reported. Galvão went on to report that, in line with the “increasing priority” Brazil has assigned the region, the minister will also call a meeting in Singapore with Brazilian mission heads in Asia aiming to intensify trade with Asian countries. Father José Carlos Brandi Aleixo, International Relations Professor Emeritus at the University of Brasília, noted that, from the commercial as well as from the cultural and political perspectives, the increase in business between Mercosur and ASEAN will come much to the benefit of Brazil. “If Brazil takes good advantage of these ties, the country will be able to benefit significantly from this integration,” he said, referring to the fact that exports may be directed at 10 countries rather than just one, as is the case in bilateral relations.